Caution! 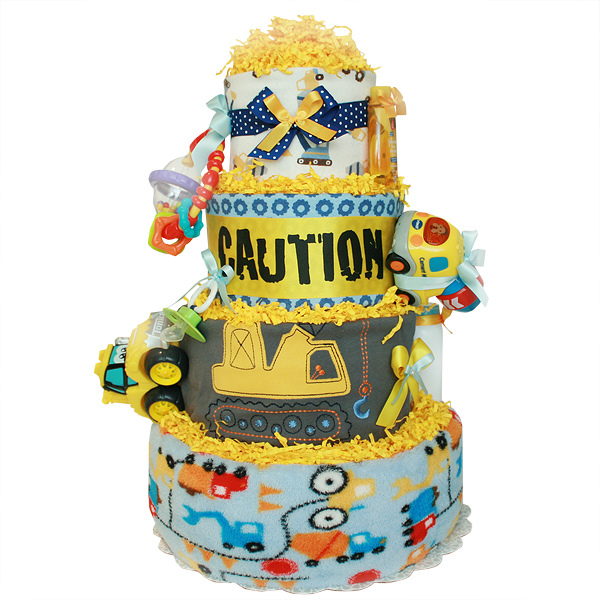 Baby Under Construction Diaper Cake is a great baby shower gift and a gorgeous centerpiece for a Cars/Construction themed baby shower. Can also be used to welcome a new baby boy in the hospital room. Four tiers diaper cake is made of 70-80 Pampers Baby Dry diapers size 1 (7-14 lbs. ), three flannel receiving blankets 100% Cotton with construction theme, one soft blue blanket with cars; one Tonka car toy; one vtech cement mixer car toy; one rattle toy; three bodysuits; two pacifiers; one JOHNSON'S Baby Shampoo (This mild, tearless formula baby shampoo is as gentle to the eyes as pure water) 1.5 fl oz; one JOHNSON'S Baby Powder Pure Cornstarch with Aloe Vera & Vitamin E (Gently absorbs excess wetness to keep skin dry and soft) 1 1/2 oz; one JOHNSON'S Baby Lotion (With that unmistakable baby fresh scent) 1 fl oz; lots of ribbons, bows and pins. The diapers are held together by elegant ribbons (no glue on diapers). Decorated with pins, bows and yellow crinkle paper. Ribbons are hand-stitched with white embroidery floss on the back of the cake, allowing for a clean, handmade look. This cake sits on a 12" corrugated cake board, 18" in height. Comes wrapped in cellophane with coordinating ribbons and bows. All our diaper cakes made of highest quality ingredients with greatest care and love. Everything included is ready to use and easy to disassemble.